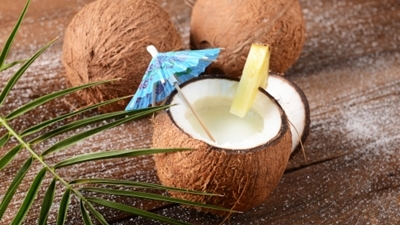 Home > Food Facts > Milk & Dairy > You Asked, We Answered: Is Coconut Milk Healthy? Last week, one of our readers asked us if coconut milk is a healthy milk alternative. Here’s what you need to know about coconut milk (and remember, if you have a question you’d like to know the answer to, ask our food expert). The milk section in your grocery store is filled with options. What used to be the “dairy” section with options for 2%, 1%, skim, homogenized, or chocolate milk now also contains all kinds of non-dairy options—sometimes from surprising sources. Each of these non-dairy milk options has enjoyed 15 minutes of fame. Soy, almond, cashew and coconut milk have all been touted as healthy alternatives to dairy milk. And yes, if you’re lactose intolerant these milks can be useful. But to the average consumer, most of the health benefits these products claim are unproven. For example, some view coconut milk as a healthier alternative to dairy milk. And on the surface this may seem possible because it comes from a fruit, not a cow. But coconut milk is extremely high in saturated fat and might not be ideal for people with high cholesterol. The research surrounding the benefits of coconut milk is inconclusive. Many of the studies have been very small and have shown conflicting results, so the jury remains out on whether it can help with weight loss or improve cholesterol, as some claim. But here’s what we do know: coconut and coconut milk are very high in saturated fat. Too much saturated fat can lead to increased “bad” low-density lipoprotein (LDL) cholesterol and cause plaque to build up in your arteries that can block blood flow, which can lead to hypertension and other cardiovascular problems. The saturated fat in coconut milk, however, is different from the saturated fat found in meat. Coconut milk contains medium-chain fatty acids (MCFAs) as opposed to long-chain fatty acids (LCFAs), common in meat. The main difference is MCFAs are metabolized in the liver more rapidly and are less likely to be stored as fatty deposits in the body. That being said, it is still undetermined how they impact total cholesterol or if they are healthier for your heart than LCFAs. Old-style canned coconut milk, for example, used mainly for cooking, had 500 calories per cup and 250% of the recommended daily saturated fat intake in one cup. Now, these numbers have changed since it’s become more commonly used as a beverage and the “So Delicious” brand offers 70 calories per cup and 20% of the daily limit of saturated fat per one cup serving. The American Heart Association (AHA) suggests no more than seven percent of total calories come from saturated fats, or 14 g on a 2,000 calorie diet. A one cup serving of coconut milk has 4 g of saturated fat, compared to a cup of skim milk that has 0.3 g of saturated fat. Furthermore, the average American glass is about a two cup serving (or more) so a glass of coconut milk likely provides 8 g of saturated fat, almost half the daily allowance. If you have high cholesterol already, I wouldn’t recommend regular consumption of coconut milk. The jury is still out on whether or not it has any positive impact on decreasing LDL and coconut is a fruit the AHA recommends avoiding if you have cholesterol problems. If you’ve got healthy cholesterol levels, I see no problem with occasionally drinking coconut milk as a dairy alternative. “Heart-Healthy Diet: 8 Steps to Prevent Heart Disease,” Mayo Clinic web site, April 20, 2012; http://www.mayoclinic.org/diseases-conditions/heart-disease/in-depth/heart-healthy-diet/art-20047702, last accessed March 26, 2014. Conis, E., “Got Coconut Milk,” LA Times web site, March 22, 2010; http://articles.latimes.com/2010/mar/22/health/la-he-0322-nutrition-lab-20100322, last accessed March 26, 2014. Lewin, J., “The Health Benefits of…coconut milk,” BBC Good Food web site, http://www.bbcgoodfood.com/howto/guide/ingredient-focus-coconut-milk, last accessed March 26, 2014.